PLEASE NOTE! Due to a power outage at King's United Church, Loch Katrine the visitation for Edgar Sinclair will now be held today, Friday from 12 noon until time of funeral service at 2 pm in the Goshen Community Centre. 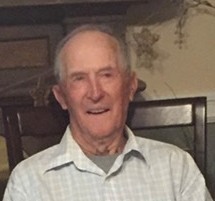 SINCLAIR, James Edgar Age 93, formerly of Goshen, Guysborough County passed away peacefully on Monday, November 26, 2018, in the Port Hawkesbury Nursing Home. Edgar was a son of the late Edward and Hannah (Jordan) Sinclair. He was born in Goshen and remained there his whole life until 2010 when he and his wife Marie moved to Antigonish to be with their daughter Cheryl. Edgar had several jobs over the years including school bus driver, truck driver, bulldozer operator, woodsman and in later years helped manage Sinclair's Meat Market with his wife and son. His main job was a beef and sheep farmer. His land was his passion. He worked on his land cutting pulpwood, trimming trees and just enjoying the view. Edgar raised horses for years and would show them at the Fall Fair in Antigonish where he also enjoyed attending the horse pulls. He spent many hours at Robert MacNaughton’s General Store in Goshen with his many male comrades, probably conversing about their land, their livestock and families. He thoroughly loved a good game of cards and would always bid way above the hand he held. He was a member of the Goshen Community Centre and a long time member of the Liberal Party. He is survived by son, Jimmie(Judy), Goshen; daughter, Cheryl, Antigonish; six grandchildren, Jolene, Natasha, Courtney, Matthew, Evan, and Garrett; nine great-grandchildren, Jorja, Cole, Ava, Grayson, Jaelyn, Raya, Huxley, Harlow and Holden; sister, Marion(Allen) Lathem; sisters-in-law, Sandra Sinclair and Edna Cole; many nieces, nephews and their families. Edgar was predeceased by his wife of 65 years, Marie(Cole) who passed away May 3, 2018; brother, Charles; sister, Isabel Sutherland. Cremation has taken place. Visitation will be held Thursday from 2-4 p.m. and 6-8 p.m. in King’s United Church, Loch Katrine, from where funeral service will be held Friday at 2 p.m. with Rev. Meredith Marple officiating. Interment in Goshen Cemetery. Family flowers only please. Memorial donations may be made to Alzheimer Society of Nova Scotia or Goshen Cemetery Fund. A special thank you to the Port Hawkesbury Nursing Home Staff for their loving care of our Dad over the past ten months. Funeral arrangements are under the dignified and compassionate care of G.W. Giffin Funeral Home. On-line condolences may be made at www.gwgiffin.com.